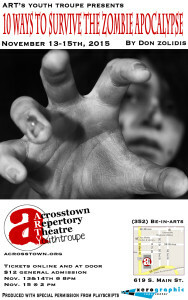 The Acrosstown Repertory Theatre Youthtroupe (ARTY) is a chance for young actors and artists to get involved in community theater. The ART Youthtroupe’s goal is to promote and facilitate youth-run theater in the greater-Gainesville community by providing free opportunities for young theater patrons to support and champion the dramatic arts. Our debut ARTY performance was Randy Wyatt’s The Fantasist in June 2015. You can see photos, videos and our cast and crew for The Fantasist here. 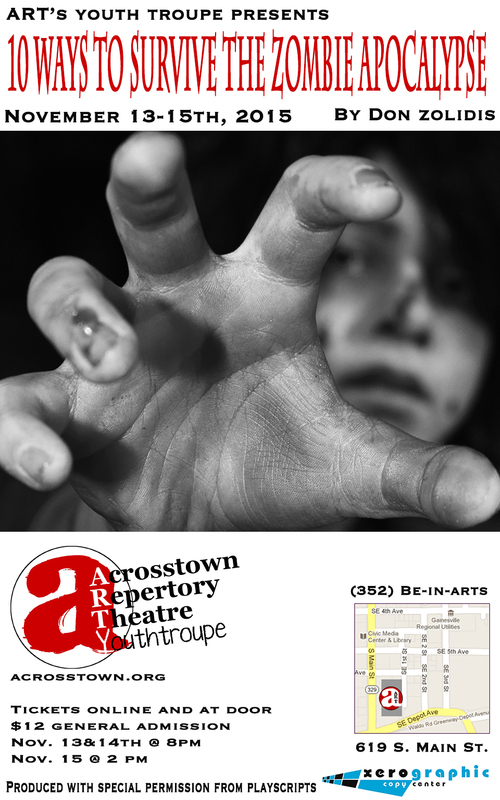 The next ARTY Youth Troupe production will be 10 Ways to Survive the Zombie Apocalypse by Don Zolidis, November 12-15, 2015. You can see photos, videos and our cast and crew for Zombies here. In December, we will have an ARTY holiday show on December 18 & 19, Plum Pudding for Christmas by Virginia Kahl & Herschel & the Hanukkah Goblins by Eric Kimmel. The shows will be directed by Susan Washington and Kathy Byrne. You find more information about our holiday shows here. If you would like to get involved in future productions, please read this information.